The Circulars award programme offers recognition to individuals and organizations from commerce and civil society across the globe that have made a notable contribution to driving circular economy principles. Last year we were delighted that the Great Recovery and Sophie Thomas received Commendations in both the ‘Accenture Award for Circular Economy Pioneer’ and the ‘Fortune Award for Circular Economy Leadership’. And yesterday, in Davos, the winners for this year were announced. Congratulations to all the finalists. You can find out who won and more about their work here. Yesterday, to coincide with the beginning of the World Economic Forum in Davos, the Ellen MacArthur Foundation launched their latest report ‘The New Plastics Economy: Rethinking the Future of Plastics’ written as part of their Project MainStream initiative. The report seeks to rethink the incremental and fragmented improvements being made and provide a fundamental rethink of the way we use plastics, to give a vision for their materials flows within a new and circular economy. 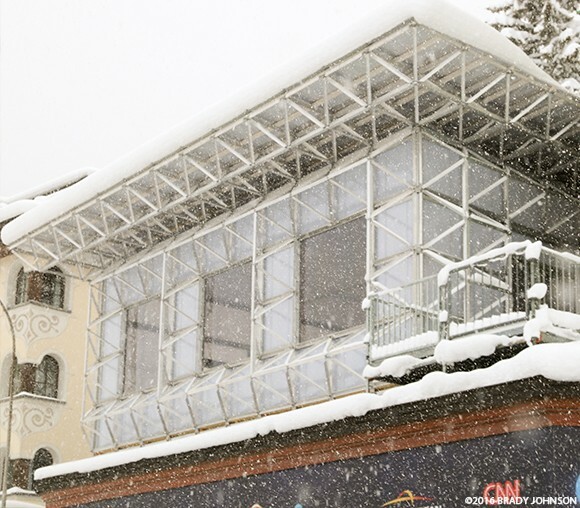 Showcasing the principles of Cradle to Cradle design, and providing a place for the Davos delegates to meet and discuss the future of the circular economy, William McDonough + Partners architects have created ICEhouse. Designed for full dissassembly, the structure will ‘melt away’ at the end of the conference, ready to pop up again elsewhere.